February is green on the Serengeti – a perfect safari backdrop for lions, cheetah, and leopards as they stalk prey. While zebras, giraffes, and gazelles nurse their young and newborn wildebeest calves frolic on the plains alongside their moms, predators skulk in the fresh grasses. Elephants drink and wallow in water among the baobab trees, flocks of storks dot the plains searching for insects, and oxpeckers feast on small insects on giraffes. 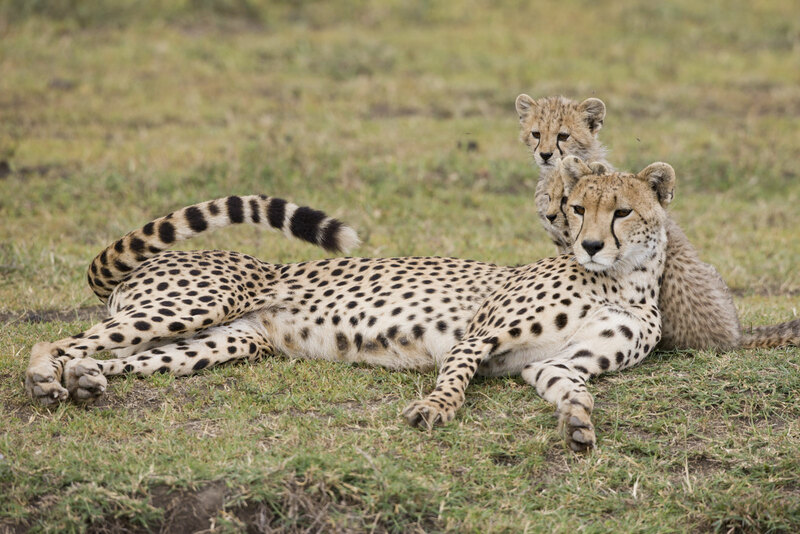 The southern Serengeti plains hold cheetah with frisky cubs and leopards hunting along the river corridors. Our stretch, pop-top Land Cruisers provide 360° views for wildlife viewing and photographic opportunities. We also provide flexibility in our schedule with only four participants per vehicle throughout the safari. When the Cheesemans started leading East African safaris in 1978, they didn't dream that they would still be going back there year after year. But with almost 50 species of mammals, colorful reptiles, and over 300 species of birds, how can you resist? • Watch enormous elephants dwarfed by towering baobab trees in Tarangire National Park. • Gaze at the dense herds of wildlife contained by the lush caldera walls of Ngorongoro Crater. • Experience the vast plains as far as the eye can see in the midst of blue wildebeest, Burchell’s zebra, cheetah, and leopard scattered in the Serengeti. • Delight in watching the olive baboons and blue monkeys leaping from tree-to-tree in Lake Manyara National Park. • Continue your journey on our Kenya extension from February 21 to 28, 2020. Discover the many arid-adapted species unique to Kenya: the highly endangered Grevy’s zebra, reticulated giraffe, gerenuk, Beisa oryx, and unique birds like Somali ostrich and golden-breasted starling. • After the Kenya extension, continue your journey on our Mountain Gorilla extension from February 27 to March 3, 2020. Trek the forests of the Virunga Mountains to encounter Rwanda’s "gentle giant," the mountain gorilla. Feb 5 Travel to Arusha, Tanzania. Feb 22 Fly to Nairobi to continue on our Kenya extension or arrive home. Emmanuel has great knowledge of the terrain and wildlife of Tanzania that is matched by a great sense of humor and contagious chuckle. He was a driver/naturalist for Ngorongoro in the 1980’s when Doug and Gail met him. His father was head chef at Ngorongoro Crater Lodge, giving him a wonderful opportunity to learn about its special wildlife while growing up. James has the most experience of all our guides in Tanzania and is considered the wizard of the safari scene. Once, when we arrived at a flooded river with many cars queued and waiting to cross, James rerouted us to a little-known crossing that was not flooded and we were soon on our way. He is a very wise man and an inspiration to his daughter who recently earned her Master's degree in biology and manages one of the national parks in southern Tanzania. James is a warm and friendly person with lots of knowledge that he will share with you. Maulidi, like many of our Tanzanian guides, has been working with us since the late 1980s. He is a true intellectual who spends hours studying nature, even learning the scientific names plus many interesting facts of the species you encounter. It seems that he has "eyes in the back of his head" because of his keen spotting abilities used to find hidden leopards and other wildlife. 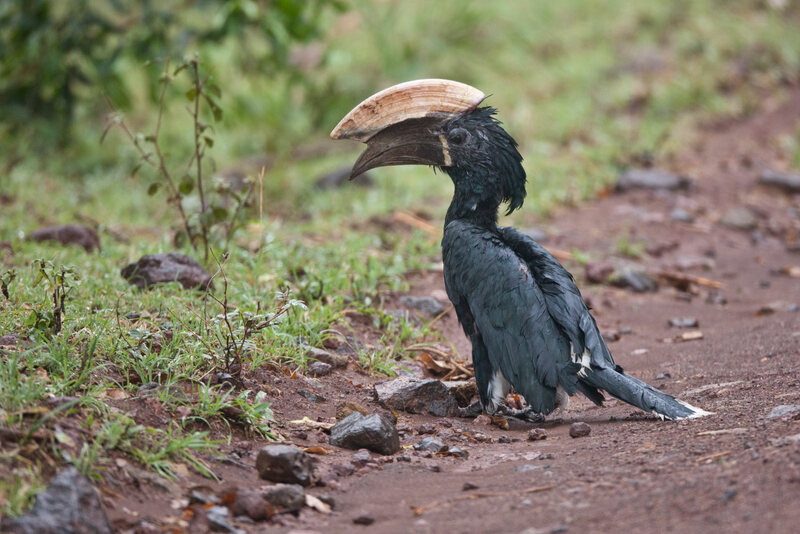 He knows all the bird songs, which he began learning as a boy growing up west of Tarangire National Park. He is a wonderful teacher and safari companion. Steven has been guiding for us in Tanzania since the late 1980s. He is, to a great extent, self-educated and is even now taking exams to finish his degrees. He learned to speak English when he was in the Tanzanian Army. He often studies mammal, bird, and plant books and puts his extensive knowledge to work in the field to find the best wildlife action. 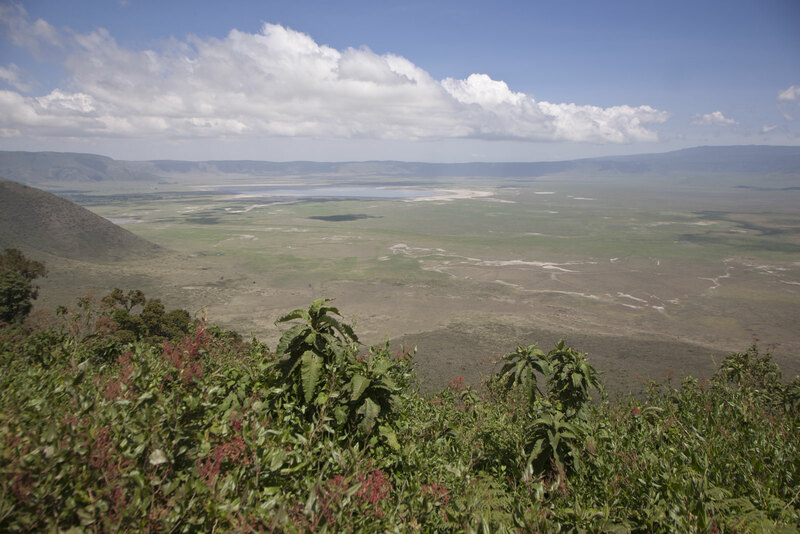 Steven grew-up on fertile highlands near Ngorongoro Crater. He has a wonderfully warm personality, is a great leader, and highly respected among the safari guides in Tanzania. Yuda grew up near the east side of Kilimanjaro near the Kenya border on land that is now part of Mkomazi National Park. He worked at a wildlife sanctuary before becoming a guide and is especially knowledgeable about animal behavior. Due to his long hours in the field observing wildlife, he understands their feeding, hunting, and other behaviors, especially the cats. Like all our Tanzanian guides, he is aware of the elements that make a good photo and will position the vehicle to achieve the best action in the best light. Arrive at Kilimanjaro International Airport (JRO) near Arusha, Tanzania by this evening. Stroll the hotel grounds around dawn to observe the birds beginning their day. After breakfast, greet our resident guides and depart for Tarangire National Park for an elephant extravaganza. Discover the dense community of African elephants dwarfed by towering baobab trees glimmering in the light. Watch for the different elephant behaviors – scooping water in their trunks to drink, splashing water onto their backs to cool off, using their toe nails to cut grass to eat, and if you’re lucky, boisterous wallowing in the river and mud. Tarangire is also home to two bird species you won’t find elsewhere – ashy starling and yellow-collared lovebird. Weave through the Ngorongoro Conservation Area to descend from the Ngorongoro Crater rim into its astounding ecosystem 2,000 feeet below. The Crater caldera contains 110 square miles of grasslands, marsh, and fresh and alkaline (brackish) lakes, providing habitat to about 25,000 large animals. Lion prides, hyena cackles, and jackal families interact uninhibited by vehicles while nervous wildebeest calve and nurse young. Track black-maned male lions unique to Ngorongoro to highlight just one of the many interrelationships between the wildlife and its ecosystem. In the evenings, catch the last glimmer of light reflecting on the alkaline lakes within the crater. Watch the rich colors unfold during sunrises and sunsets and discover the abundant bird activity around our lodge up on the crater rim. You will marvel at the expansive grasslands of the vast Serengeti Plains spread before you as you enter Serengeti National Park. The alkaline soil, rich in salts like calcium and sodium, creates a hardpan that prevents tree growth and holds rainwater close to the surface to facilitate dense grass growth. Continuous grass cropping during feeding maintains this productive and rich food source that sustains the large numbers of wildebeest and other ungulates. Amid the grasslands, scan the protruding granite kopjes (pronounced “copies”) for predators watching their prey scattered on the plains below. Lions, cheetah, and leopards dominate these corriders formed by marshes, the Seronera River, and the kopjes. Immense herds of blue wildebeest and Burchell’s zebras graze the short grass among the Moru and Gol kopjes. Here we will search for predators then enjoy a picnic lunch while watching the movement of these herds on our way to our lodge. During this season, Ndutu is Gail and Doug’s favorite area in East Africa because of the wildlife action found here – especially the cheetah moms with cubs who follow the wildebeest nursery herds. Over five days, you’ll have time to explore each nook of the woodlands, marshes, and Serengeti Plains in the Ngorongoro Conservation Area during off-road game drives. Wildebeest calving occurs during a three week period when about 80-90% of the calves are born, increasing the likelihood more young survive. We’ll also watch for exciting predation behaviors when hunters attempt to catch a calf. Be on the lookout for cats like serval, African wild cat, cheetah, leopard, and lion in this area of the Serengeti. And don’t be surprised if we have an unexpected guest at dinner – a family of genets live on the lodge grounds! Other special species in this area include Fischer’s lovebirds that frequent the lodge’s bird bath, steinbok, gray-breasted francolin, and chestnut-banded plover. Bid farewell to the woodlands, marshes, and plains of Ndutu and head to Olduvai Gorge on the eastern boundary of the Serengeti Ecological Unit. 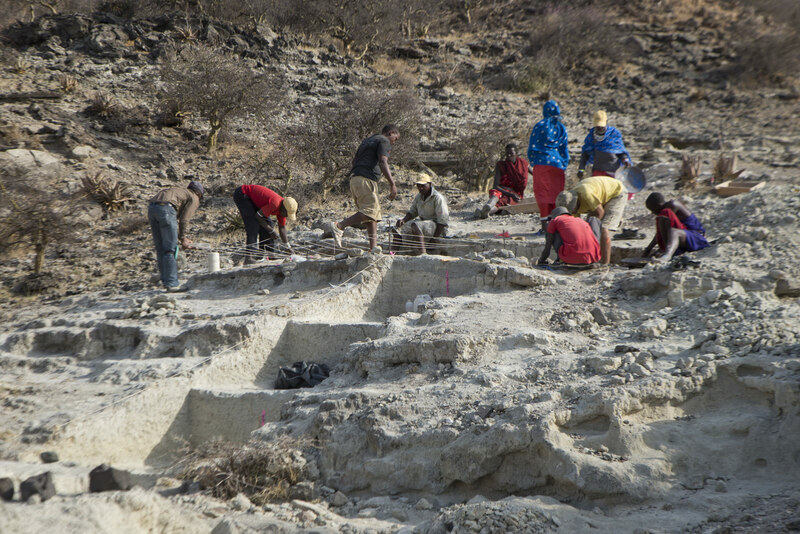 Here the Leakeys found the hominid remains "Zinjanthropus”/Australopitchecus boisei, Homo habilis, and Homo erectus, plus many other fossils exhibited in the museum at Olduvai. Descend into the gorge and visit “Bed I” where Mary Leakey found "Zinjanthropus." If you search the adjacent wash, you may find some fossil fragments. A new Masai cultural boma has been established at Olduvai where we can experience the traditional way of life of these pastoral people. After our visit in the gorge, we will retrace our drive along the Ngorongoro Crater rim to our lodge near Lake Manyara National Park, atop the escarpment formed by the Great Rift. Find olive baboons grooming themselves along the forest road, blue monkeys chasing each other in the tree branches, elephants foraging in the forest, and silvery-cheeked hornbills calling and flitting among the canopy openings. An abundant number of fig, mahogany, and fruit trees grow and thrive above the underground water supply in this groundwater forest. Share a special farewell luncheon with our guides and then drive to Kia Lodge near the Kilimanjaro International Airport. If you are not continuing on the Kenya Extension, use your dayroom at the lodge (included) to refresh and prepare for your flight home, or stay overnight to prepare for our Kenya extension. Fly to Nairobi to join our Kenya extension or arrive home. Discover the many arid-adapted species unique to Kenya: zebras, giraffes, and unique birds. February is green on the Serengeti in Tanzania – a perfect safari backdrop for lions, cheetahs, and leopards. All leaders, park entry fees, and permits for all activities unless described as optional. Accommodations for the nights of February 6 through February 20 and a dayroom on February 21. Meals from breakfast on February 7 through lunch on February 21. Transfers to your hotel on February 6 and to your dayroom on February 21 (Kia Lodge has a complementary shuttle to the airport). Limited bottled water – each lodge provides bottles of drinking water in your room daily. All airfare, airport and departure taxes, and excess baggage fees. Airfare is approximately $750–$1,500 roundtrip from US, depending on origin (subject to change). Bottled beverages – bottled water costs extra during meals, except at breakfast when water is often available to fill your reusable water bottle. Alcoholic and other beverages cost extra. Gratuities – tipping is, of course, discretionary, however we suggest budgeting about $22 to $25 per participant per day for February 6 to February 21 with our leaders (about $352 to $400 total per participant). Items of a personal nature such as laundry, telephone calls, medical costs or hospitalization, room service, and items not on the regular menu, etc. If you have special dietary needs, please indicate them on your Reservation/Release Form. Temperatures generally range from around 65°F at night to 92°F during the day (18–33°C), but the temperature depends on the elevation. Although most days will be warm to hot, it can be cool and breezy in the Land Cruisers early in the morning and in the late afternoon. This is the dry season between the “short rains” of November/December and the “long rains” of mid-March through mid-June, but rain is still possible. Most days consist of early mornings, game drives on bumpy roads, and long hours in nature that require good energy levels. Most walking is optional and around lodge grounds between game drives. Please contact us if you have any health concerns that may make this trip challenging. Flights you (or a travel agent) book: Arrive at Kilimanjaro International Airport (JRO) near Arusha, Tanzania, by February 6. For most, this means departing from home on February 5. Depart from Kilimanjaro International Airport (JRO) on the evening of February 21. If you are continuing on our Kenya extension, see the Flights section in its itinerary for departure information. Which safari is right for me if I want to travel to Africa? If this is your first African safari, we suggest taking both our Tanzania and Kenya tours to experience the quintessential African safari. The grassy Serengeti Plains of Tanzania and Kenya spread unbelievably from horizon to horizon and are often covered with migrating herds seeking fresh grass while being pursued by their predators. In northern Kenya, you will experience a more arid landscape populated by the specially adapted animals that live there. Animals are also generally more accustomed to vehicles so you can get quite close. Our Botswana safari provides you with a unique immersion into wild Africa through carefree mobile camping that gives you an intimate 24/7 connection. The extensive waterways of the Okavango Delta spread on the dry, sandy landscape of Botswana and create quite the contrast to the grass-covered Serengeti Plains of Tanzania and Kenya. In Botswana, we find more animals suited to this dry watery environment such as hippos, elephants, and antelopes. It is possible to see the “big five” (African lion, African elephant, cape buffalo, African leopard, and rhinoceros) in all three countries. The Great Serengeti Migration is the continuous movement of vast herds of wildebeest, accompanied by large numbers of Burchell’s zebra and fewer numbers of Grant’s gazelle, Thompson’s gazelle, topi, kongoni (hartebeest), eland, and impala. Throughout the year the herds move in a circular, clock-wise pattern around the Serengeti, heading northward or southward, seeking new green grass. 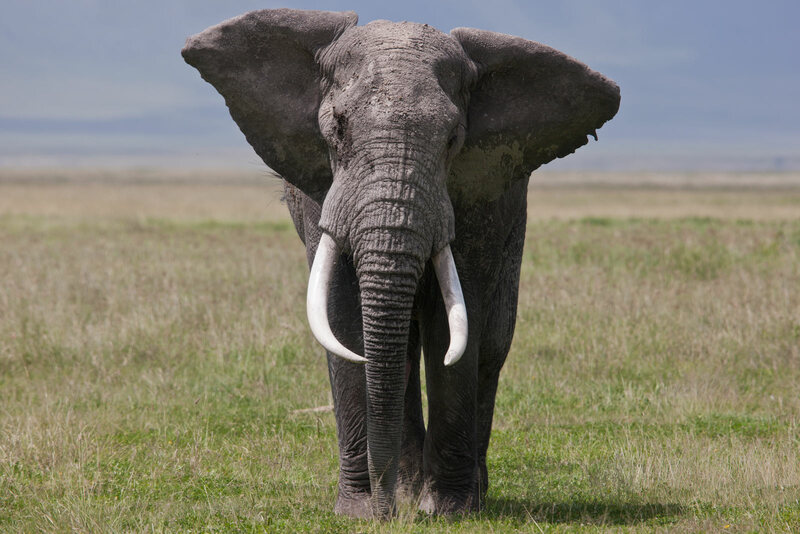 It is the world’s largest terrestrial mammal migration! The exact timing of the migration is dependent on the seasonal rainfall that freshens the grass consumed by ungulates. Throughout the year the herds move in a circular pattern around the Serengeti, heading northward or southward, seeking new green grass. In January/February, wildlife is concentrated in the southern Serengeti short grass plains of Tanzania. In July/August, the famous Mara River crossings of wildebeest and zebra occur in the northern Serengeti ecosystem right on the border of Tanzania and Kenya. While the herbivores migrate through the Serengeti, they pass through the territories of many predators, such as lions, cheetahs, leopards, and hyenas. Why are the January/February and July/August itineraries different? 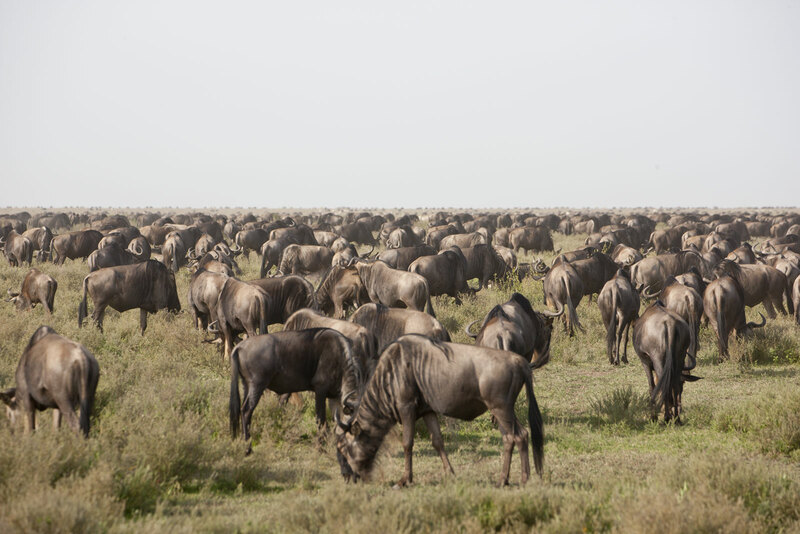 Our itineraries follow the concentration of the great ungulate herds during their migration through the Serengeti ecosystem. In January/February, we spend almost twice the number of nights at Ndutu in the southern Serengeti in Tanzania. Here we can drive off-road, which provides ample opportunities for unique experiences. The cat population around Ndutu is one of the best in all the Serengeti with serval, African wild cat, cheetah, leopard, and lion. In July/August, we focus on the Mara River near the Kenya border where much of the wildlife is concentrated. What species are present in both seasons? In both seasons we can see similar species (about 50 mammals and 250 bird species) but an additional 25 northern bird species migrate south in January/February. In July/August we have a better chance of seeing denning African wild dogs. Do we see large herds in both seasons? Yes, but the distribution is different. In January/February the wildlife is grazing on the short grass plains, often in lines or dispersed over the plains, only visiting water sources when needed. While in July/August, the wildlife is concentrated around water sources. What is the difference in animal behaviors between both seasons? In January/February, wildebeest are calving and other ungulates (such as zebra) are nursing young, and cheetah females with cubs are more visible as they follow the herd movements. In July/August, although not guaranteed, we have the best chance of seeing herds of zebra and wildebeest cross the Mara River while trying to avoid crocodiles. What is the difference in climate between both seasons? January/February is warmer since it’s the summer season in the southern hemisphere. How much time do we spend in nature? We spend maximum time in nature! We offer two game drives per day – early morning and afternoon. We typically leave the lodge around dawn, come back for lunch (or have a picnic lunch), head back out an hour or so after lunch, and return for dinner (sometimes late). Be prepared for long days. Can we walk around to see the wildlife? For safety reasons, we are not permitted to leave the vehicles on safari drives, although we can walk around the lodge grounds. What is Cheesemans’ background/history in East Africa tourism? Doug and Gail have been leading safaris since 1978 and have known many of the local naturalists/guides since they were young adults. Not only do you have experts on wildlife behavior, but you also get a unique family-like experience from spending time with Doug, Gail, and the local guides. We stay in top-notch lodges with private baths in close proximity to the parks/reserves and wildlife. We travel in pop-top Land Cruisers with shaded roof covers that provide 360° viewing and excellent photography opportunities. With only four participants in each seven-passenger vehicle, you’ll have more space for your gear and changing vantage points. Be prepared to experience bumpy, unpaved roads, and although our vehicles are comfortable, you will be jostled around. "This has been the best photo tour out of the 12 that I took during my very extended sabbatical. The variety of wildlife is incredible and the wildlife activity was equally incredible." "I tell friends and family that I doubt I could go with another company after spending a couple weeks with Doug and Gail. The attention to detail was perfect, the lodges were fantastic, the guides exceptional, and the pre-trip information was great."